The much-anticipated India tour of Australia is about to get underway. Before the all-important Test series, the 2 teams will engage in a battle in the shortest format of the game. The first of the 3 matches will be played on November 21 at the Gabba, Brisbane. 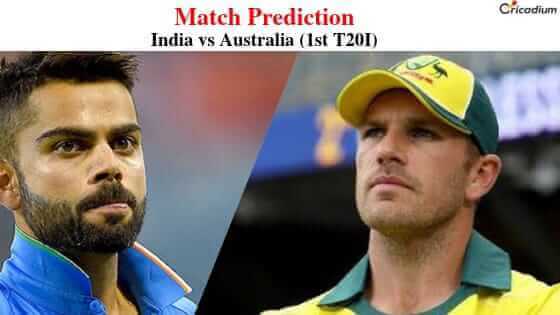 Keep reading to find out the India vs Australia 1st T20 Match Prediction. Australia has had a torrid time in international cricket of late. Across all formats, they have struggled. Very recently, they faced South Africa at home where the visitors won in both ODIs and T20I quite comfortably. Also, they are without the services of Steve Smith and David Warner that makes a massive difference. The Men in Gold will have to play out of their skins to win against India, a team that has been in great form in limited overs cricket. In fact, the Men in Blue have won 7 straight series in T20Is. Additionally, Virat Kohli, who was rested for the Windies series, makes a comeback. Previously, India had won 3-0 in 2016 against Australia in their own backyard. As a result, the odds lie heavily in India’s favor. India vs Australia 1st T20 Match Prediction: India’s superlative run in T20 cricket and Australia’s poor run makes the former favorites for the 1st game. Unless the hosts pull off something special, India should take a 1-0 lead.